By giving to UT Elementary School, donors can create a lasting impact upon the individuals and communities that we serve. Here are just a few ways that the work of UT Elementary School is impacting their students and the community through the generous support of our donors. Alexis Blackman has called herself a Longhorn since she was a kindergartner at age 5. As the first UT Elementary School alumna to attend the “big UT,” she will do so on a full tuition scholarship from the University Co-op. Blackman, who is majoring in electrical engineering, first became interested in engineering in fifth grade due to UT Elementary School’s focus on science and math. She went on to attend Ann Richards School for Young Women Leaders and Crockett High School where she earned numerous awards, including the AISD Trustees’ Award for remaining in the top 10 percent of her class throughout high school. She attributes her success to the solid foundation she received at UT Elementary. 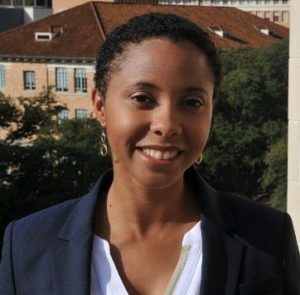 UT Elementary School fifth-grade teacher and UT Austin alumna (’12) Scarlett Calvin is the kind of teacher we all would have liked to have had. Not only is she a great science and math instructor, but she is energetic, cheerful and dedicated to her students. 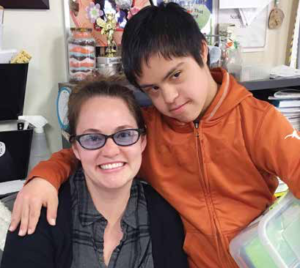 During the 2015-16 school year, one of her students, Alejandro, had the genetic chromosome disorder known as Down Syndrome. Calvin made certain he received the best possible education. “Working with Alejandro was an honor,” said Calvin. “I learned endless lessons about what children with Down Syndrome are capable of. He was able to teach his classmates about inclusion, celebrating differences, and the sciences behind his condition. We ultimately learned that Alejandro is capable of accomplishing anything he sets his mind to, right alongside his peers—and he made us laugh along the way,” said Calvin. She was recently honored with the Lori Tullos Barta Outstanding Educator Award from the Down Syndrome Association of Central Texas. The association sponsors the Buddy Walk annually, and Calvin enlisted her whole class to participate. 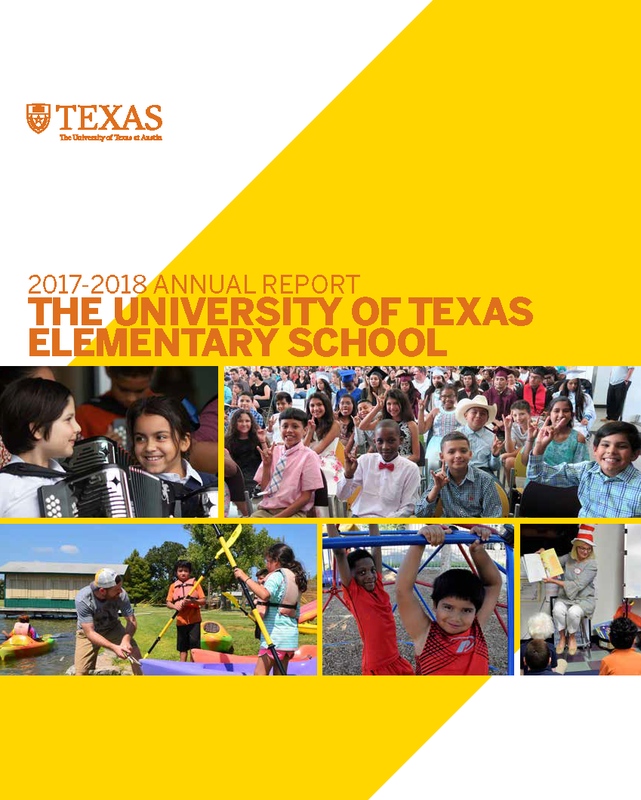 Although a number of universities across the country have opened public charter schools, often to pursue innovative educational strategies or to have a setting where preservice teachers can learn, Dr. Melissa Chavez explains that UT Elementary School has a broader mission. “Those goals are very important at UT Elementary, but the school was also established so that academic units at UT Austin have a way to extend outreach to the community and provide professional development opportunities for those academic units,” she says. Other programs and enrichment activities at UT Elementary that are partnerships with the “big UT” include the UT Strings program with the Butler School of Music, field trips to the Blanton Museum on the UT Austin campus, a special program with the School of Architecture and a STEM partnership with the iSchool. All provide an educational margin of excellence that many elementary schools cannot offer. Other initiatives, such as Active Learning Classrooms with the School of Nursing, provide a field study and research experience for UT students while supporting student learning. “By working together, students, faculty and staff at UT Austin and UT Elementary School all learn and benefit from the partnership,” says Chavez. Through the school’s partnership with the UT College of Education, every teacher at UT Elementary has a pre-service or “student” teacher in his or her classroom. The training the preservice teachers receive has been described as “phenomenal” by former student teachers. Just ask Kameron Koeffler, the newest UT Elementary School teacher to successfully complete UT Elementary’s pre-service training. Last year he interned in Michelle Hernandez’s third-grade class. And at one point, he and the intern in Noura Wakim’s class switched places for a month, so he had the opportunity to work under the direction of two teachers and experience two very different but effective styles of classroom management. 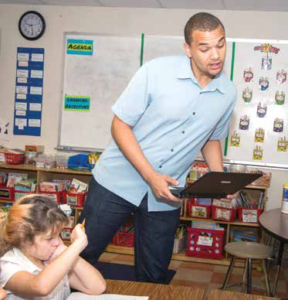 Through the UT Austin special education program that he was enrolled in, Koeffler had the opportunity to intern at other schools in Austin as well, yet his heart remained with UT Elementary. “UTES was no typical charter experience. From day one, I felt accepted by the school community, free to express my creativity, and truly appreciated for my efforts by teachers and parents alike,” he said.